Before I go into model specifics I’d like to cover some more of the broad strokes. What does USARF play like? Sure there aren’t too many models to judge them by yet, but so far, they seem a little different from the other sectorials. Merovingia are the sneakiest of all. They can get at least limited camo on even their most basic troops. They’re also highly mobile and can take a ton of paratroopers. Caledonia has a few great sneaks of their own but they’re also a little sturdier with heavily armored Mormaers and multi-wound Wulvers. Of course this is Infinity so it always feels a little wrong to try to define roles so tightly, but in my mind those are the most obvious things that set the two sectorials apart. What they have in common is cheap troops. Not just in terms of army points but also SWC. Merovingia and Caledonia both have access to a great array of special weapons that come at costs low enough to make the other factions jealous. So how does USAriadna stack up compared to the rest of the faction? Well they don’t quite have the cheap troops of their fellow Ariadnans, but the standard GRUNTS are pretty amazing. These guys are Medium Infantry. Garrison troops like these are typically some of the cheapest troops available to an army Unless I’m quite mistaken the GRUNTS may be the only Garrison or Line Troops in the Medium Infantry category. Not just in Ariadna but in the entire game. They’re also significantly cheaper than most Medium Infantry, and have access to an interesting array of weapons. 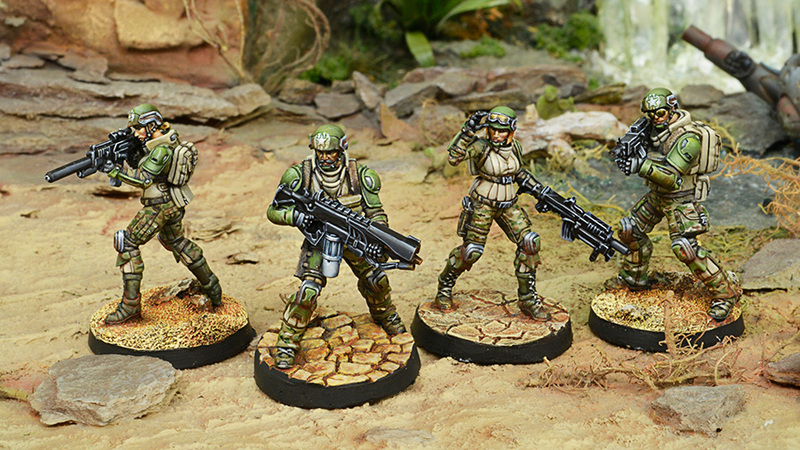 Their AVA is Total so they will allow USAriadna players to form a sturdy core to their army with decent firepower without breaking the bank. Unfortunately they are a tad slow like most MI so they can limit your army’s mobility. OK, so lots of relatively sturdy guys, what else? Well since speed can be a problem for the GRUNTS, we have some troops on motorcycles to make up the difference. 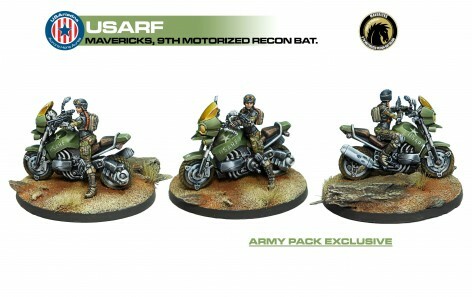 Mavericks are fast and they’re also kinda tough for bikers (in Infinity terms) since they’re Medium Infantry just like the GRUNTS. And hey look at that – I do believe MI bikers are another Infinity first. 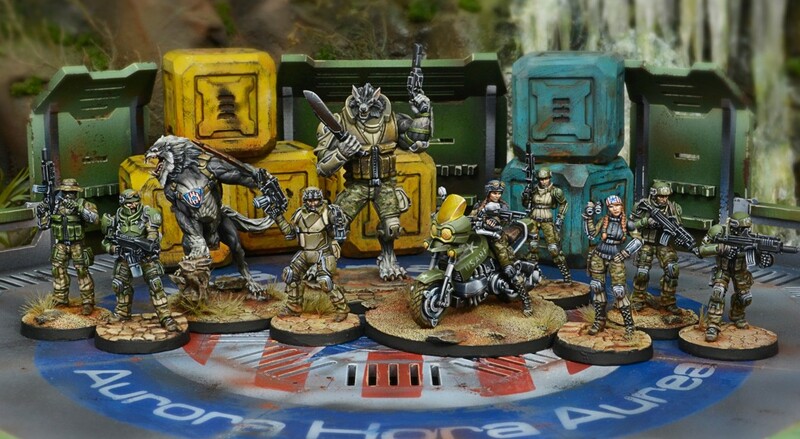 If AVA five bikers aren’t enough for you to control the board there are also the Foxtrot Rangers and Hardcases with Infiltration. 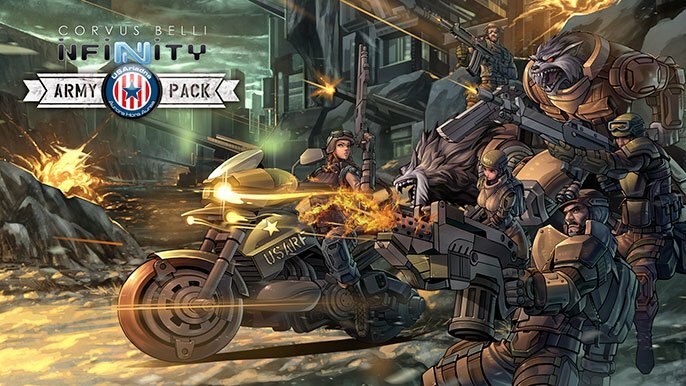 With these tools you should be sure you’ve got troops wherever you need them. So USAriadna can make a pretty survivable force with enough manueverable elements to keep them from getting outflanked. Of course every faction also has its weaknesses. USAriadna shares some of these with the rest of Aridna. The first is obvious: no hackers. Ariadna as a whole is lacking for hacking but vanilla and Merovingia can recruit some outside hackers and even Caledonia can get a Defensive hacking device. Ariadna has none. You’ll have to find clever ways to take out those TAGS. And if its missions you’re worried about, USAriadna has plenty of other specialists and they’re all quite affordable. Ariadna as a whole also lacks any really sturdy models, and USAriadna is no exception. Sure the Devil Dog is ARM 4 with a couple of wounds but it just doesn’t stack up to something like a Squalo or even an Uhlan. Then there’s the fact that there aren’t any really good shots in Ariadna. In the entire faction there’s only one model with BS14 and she won’t work for the USARF. The few models with BS13 typically don’t come cheap. It’s even more limited in USAriadna. Fortunately they seem to have plentiful Multispectral visors, so CH troops won’t cause an extra headache. Their last impediment is a lack of AD troops. Only Van Zandt can use any form of Airborne Deployment. I love AD so I can’t help but feel like it will be a little rough when the only drop troop available is 38 points. At least they have it better than Caledonia, who don’t have any. Overall I think USA will be really strong. The abundance of Medium Infantry combined with high mobility seems like it will make them very competitive. I do think they will struggle some against TAGS. 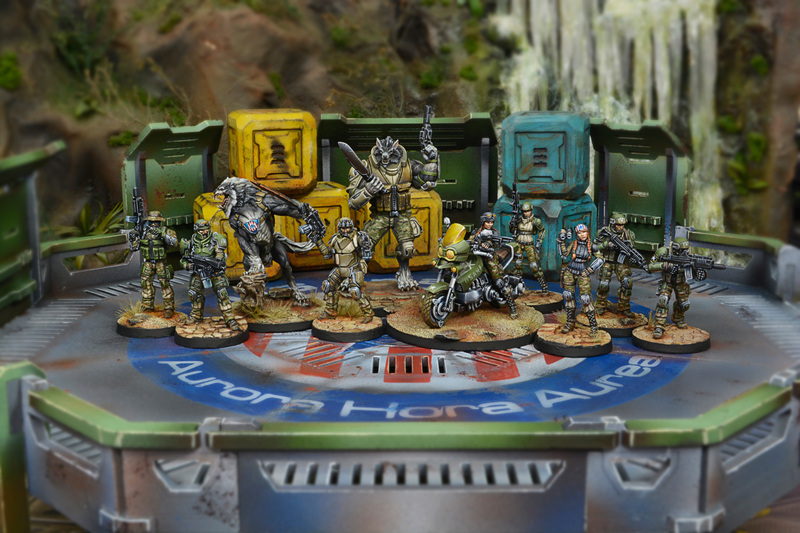 TAGS will have to be fought the true Ariadna way, with glue guns and D-charges or firing Uragan missiles from behind cover once they’ve been Targeted. That’s right those are all old tricks that USAriadna can use. I can’t wait to get my own box painted up to see how they play. I’ll be back soon to go into more details about the individual models in the USAriadna box. ~What do you guys think about this new subfaction. Have they reached your area yet? How are they performing on the tabletop?